Five senior engineering students at the University of California, Santa Cruz, are trying to push the limits of low-power wireless transmission to facilitate the monitoring of remote natural environments. The apparatus they are building will track conditions on coral reefs in distant locations and beam information back in real time to a land-based station. The students named their creation SEA-LABS, short for "Sensor Exploration Apparatus utilizing Low-power Aquatic Broadcasting System." SEA-LABS was originally designed to help UCSC biologist Donald Potts track environmental changes that affect the reefs of Midway, a remote atoll of the Hawaiian archipelago. 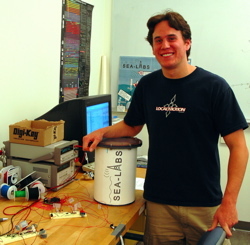 But SEA-LABS also has the potential to become a low-cost tsunami-warning device, said Matt Bromage, a computer engineering student who acts as SEA-LABS team manager. According to Potts, a professor of ecology and evolutionary biology, SEA-LABS should be a vast improvement over current satellite imaging technology, which provides low-resolution data at high cost. A typical satellite survey will provide average temperatures of the ocean surface over areas up to 60 square miles, he said. "But the corals living on a reef may experience temperatures that are 5 to 10 degrees different from that average. With SEA-LABS, we will have miniaturized instrumentation that we can place right where the corals and other animals and plants actually live," Potts said. The project began with a serendipitous encounter between Potts and Katia Obraczka, an associate professor of computer engineering whose research includes wireless sensor networks. Together they hatched the idea of a collaboration, which Obraczka proposed as a student project for the senior engineering design class. Bromage and four classmates--electrical engineering senior Lee Wells and computer engineering seniors Chris Chan, Mike Maroney, and Jo Chou--volunteered. The students said they were attracted by the opportunity to build something that had practical applications and would have an impact. Now entering its final testing stages, the project should culminate this summer with a trip to the Midway atoll, 1,200 miles northwest of Honolulu, where the students will install and test their waterproof and salt-resistant prototype. Wireless data transmission is a big advantage of SEA-LABS over other commonly used environmental sensors, Bromage said. "Currently, the state of the art for remote monitoring is a sensor attached to a data logger, but you need to go out and retrieve the logger after a set amount of time," he said. Data loggers collect and store data but do not transmit it. SEA-LABS will send information in real time, first through a wireless connection to a land station on Midway, then through an Internet connection between Midway and the mainland. Ideally, traveling the 2,800 miles between Santa Cruz and Midway to service SEA-LABS would only be necessary once a year. The core of SEA-LABS is a Programmable Ocean Device (POD), which consists of a processor, a memory storage component, and a battery that can last up to two years, all housed in a waterproof casing about the size of a small wastebasket. The POD can be bolted to the seafloor near a reef. It must be completely waterproof at depths up to 60 feet and sturdy enough to withstand heavy wave action. The POD has cable connections to sensors that independently record pressure, light, salinity, and temperature. The sensors are small enough to fit in any desired location on or within a reef and can be placed right next to plants, corals, and other reef inhabitants. The pressure sensors monitor wave patterns, tides, and overall sea levels. Eventually, real-time recordings from these sensors could be used to help detect a tsunami wave. The POD connects to a receiver/transmitter attached to a surface buoy. The transmitter broadcasts the data recorded by the sensors from the POD to a base station on land via a radio antenna. The challenge for this step is to find a good compromise between signal strength and battery life, Obraczka said. "You can always increase signal strength by increasing power, but then the battery will run out sooner," she said. On the other hand, if the signal from the POD is too low, the land antenna might not be able to pick it up, which would result in incomplete data collections. With an antenna 150 feet above ground and transmitters on one-foot high buoys, SEA-LABS should work within a five- to seven-mile range. That range should accommodate the geography of the Midway reef, Potts said. But the final tuning of SEA-LABS will only be possible at Midway. "The problem is that wireless transmission is very sensitive to the environment," Obraczka said. The Midway atoll consists of three small islands surrounded by a well-developed reef. A U.S. Navy base for over 50 years, the atoll became a National Wildlife Refuge under the jurisdiction of the Fish and Wildlife Service in 1996. Since then it has suffered minimal human impact, which makes it a good place to study ecological and evolutionary responses to changing natural conditions, Potts said. The health of a reef depends on complex interactions between corals and algae, which themselves depend on water temperature, depth, salinity, and acidity. Potts expects the environmental impacts of global climate change to become detectable on Midway and its reef in the near future, but predicting what will happen is difficult. "The physical environment is unpredictable and the climatic conditions unstable," Potts said. "As climatic conditions change, the patterns of winds, storms, currents, and upwellings will change at a regional scale." An important goal of the SEA-LABS team is to provide technology that benefits users with small budgets, such as developing countries or U.S. wildlife reserves with limited government or private funding, Potts said. To this end, the students use off-the-shelf components and develop nonproprietary open-access software. Depending on the number of sensors attached to each POD, SEA-LABS should cost between $500 and $1,000 per POD. Eventually, mass production could lower the cost even further. Though only two stations will be ready this summer, Potts would eventually like to install 10 stations along the Midway reef. According to Bromage, one of the best features of SEA-LABS is the ability of the PODS to communicate with each other and establish ad hoc networks. If a POD is too far from the base station, it can transmit its information to a nearby POD, which will relay it to another POD or to the base station. The idea of the senior engineering design class is to mimic an industry environment, said computer engineering lecturer Stephen Petersen, who teaches the senior design class and advises SEA-LABS on radio frequency. While the students sharpen their engineering wits, they also learn to work as a team, a skill that will serve them well in future job settings. "We're hoping to pass it on to the next class so they can do something more sophisticated with it," Chan said.